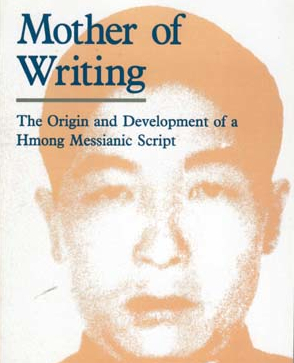 Often referred to as the “Mother of Writing” (Niam Ntawv), Shong Lue Yang (Soob Lwj Yaj) created an alphabet for writing the Hmong language, which came to be known as the Pahawh Hmong. According to Chia Koua Vang, Gnia Yee Yang, and William A. Smalley, authors of the book Mother of Writing; Shong Lue was a farmer who grew up without any formal education. But in 1959 he experienced a series of divine revelations during which he was taught the Pahawh Hmong. He was instructed to teach the alphabet to his people and believed that whoever accepted the writing system would flourish into modernization and escape the hardships of the time. Hundreds of people flocked to Shong Lue during this time, not just to learn the Pahawh Hmong, but also to hear his moral and ethical teachings. He would answered all kinds of questions, and was able to foretell the future. As the news of this spread, the communist Vietnam government began to make accusations that Shong Lue and Pahawh Hmong was part of a plot by the American CIA. Afraid of being captured by the communist soldiers, in 1963 Shong Lue left Vietnam in search of help from the non-communist regime lead by Vang Pao in Laos. While in Laos, Shong Lue Yang continued to teach the Pahawh Hmong. During this time of war, Shong Lue more than once was able to predict the exact time and place of communist attacks and prepared people for these attacks. Some people believed that he was able to predict the communist attacks only because he was a communist sympathizer, and that he must be communicating with the enemy to know about these attacks. But his followers and those closest to him never saw him with any device for communication, nor had he ever gone outside to contact the enemy. With his remarkable abilities, Shong Lue’s popularity grew and so did the number of his followers. 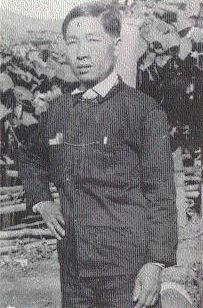 As a result, Hmong groups who supported the Royal Lao Government and the Communist Pathet Lao accused him of aiding the other. In 1971, Shong Lue predicted his own death and was assassinated by the hand of a government agent. There is still controversy sounding his assassination. In the history of the world there has been no documented case where an individual who could not previously read or write any language was able to invent a complete writing system or alphabet that can be used to read, write and pronounce all of the the words of that spoken language. In short, Shong Lue Yang’s achievement in creating the Pahawh Hmong is monumental.